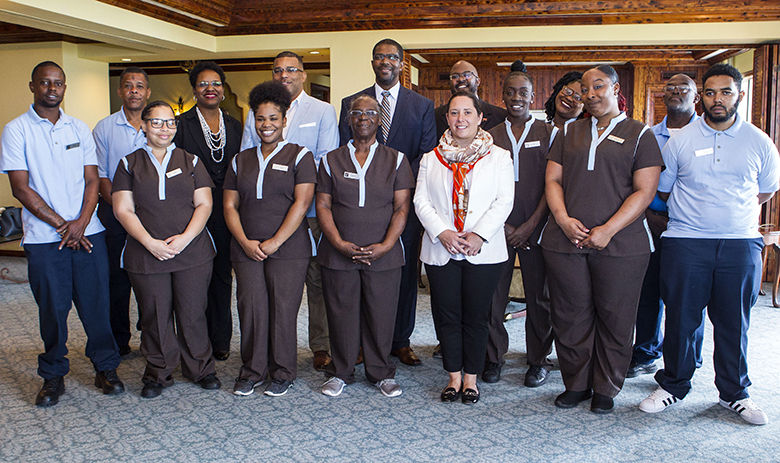 Following a two-week training course, 18 participants have been trained as guest room attendants, with the public-private partnership resulting in participants earning the American Hotel and Lodging Certification as a Guestroom Attendant. 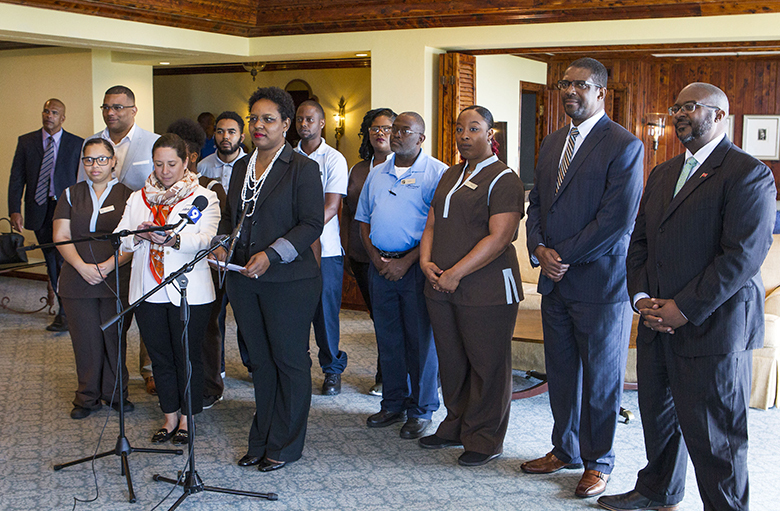 The programme was launched by the Bermuda Hospitality Institute, Fairmont Southampton, Ministry of Education & Workforce Development, Ministry of Economic Development & Tourism, and the Ministry of Social Development & Sports to train and certify unemployed Bermudians as chambermaids and housemen for future employment in local hotels. Minister of Economic Development & Tourism Jamahl Simmons thanked the participants for taking advantage of the opportunity, urging them to view it as “more than a job, but think of it a career,” noting that the hospitality industry has many leadership and other roles available. “It’s so important, the personalities, the smiles,” he said. “There is nothing better than a Bermudian at their best greeting our tourists, and your job is important because you interact with people in their rooms, and you can set the whole tone for the day. 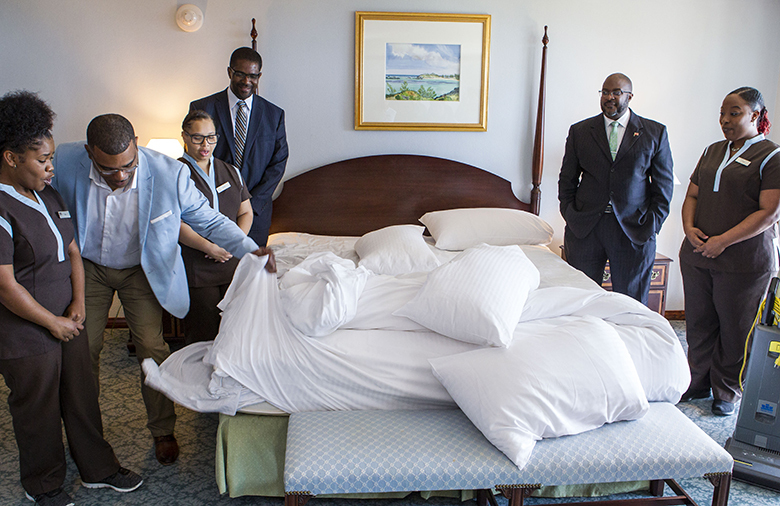 Executive Director of the Bermuda Hospitality Institute Malika Cartwright said, “It is my pleasure to share with you the details of an exciting new initiative called the Guest Room Attendant Programme. 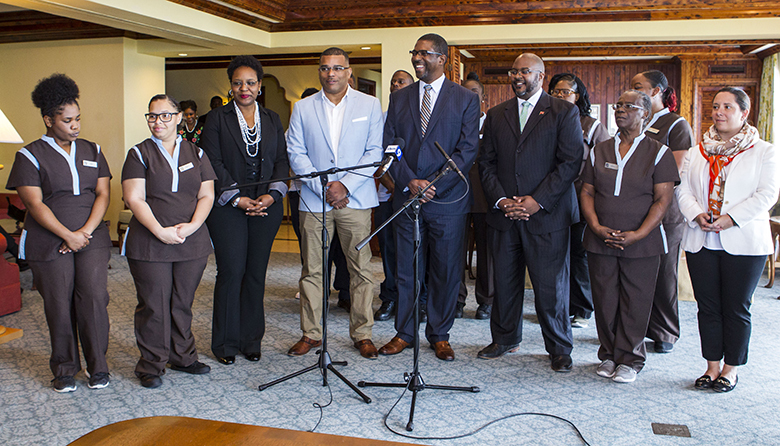 “This Public-Private Partnership was launched by the Bermuda Hospitality Institute, Fairmont Southampton and three Government Ministries – namely the Ministry of Education & Workforce Development, Ministry of Economic Development & Tourism, and the Ministry of Social Development & Sport. “Speaking as the Executive Director of the Bermuda Hospitality Institute, I can say confidently that one of BHI’s greatest accomplishments has been its work to prepare individuals for the opportunities available within the hospitality and tourism industry. “The Guest Room Attendant Programme is yet another example of this. Designed to teach people about the fundamentals and theory of housekeeping work, the initiative provides participants with a broad-based certificate from the American Hotel and Lodging Certification in Guestroom Attendant. “This certification ensures that people have the skills and knowledge needed to keep guest rooms clean, safe and well-maintained at any lodging property on the Island. Standard operating procedures for guest room attendants, or housekeepers. Guest relations and how to properly make a bed/ clean a bathroom. And the importance of the guest room attendant’s role, which extends beyond just cleaning and can play a huge part in a property’s reputation and the overall experience a guest or visitor has on the Island. “Something a lot of people overlook – is the fact that every employee of a hotel, including room attendants, are expected to warmly greet guests, no matter whether they are working in a five-star hotel or an extended stay property. “I believe that guestroom attendants are an essential part of the Island’s tourism product. They are tasked with promoting a positive image of the property to guests, and must be pleasant, friendly and able to address problems or special requests. “Hotel owners and managers rely on the customer service abilities of these service staff to provide guests with a encouraging feeling about their stay. “We wish to thank the Bermuda Government who approached the BHI with the opportunity to assist with this effort. We are excited that this course is being made available to those on Financial Assistance – to get them back to work and making a valuable contribution to our Island. “Last, but not least, we also want to thank the Fairmont Southampton for the chance to put the theory learned through the Guest Room Attendant Programme into practice, by working in their housekeeping department. While the fundamentals of housekeeping can be easily taught online, the real day to day work requires diligence, perseverance and patience. “The participants of the programme have learned valuable lessons as they move into their new START in the hospitality industry. 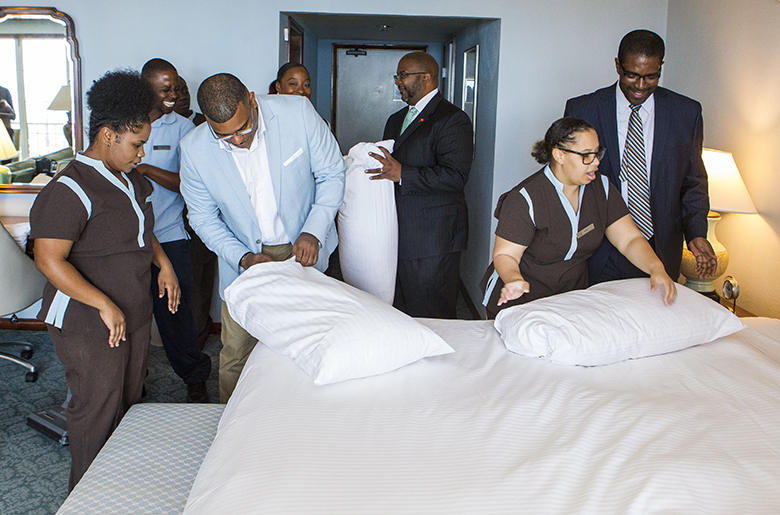 The photos above depict Minister of Education & Workforce Development Diallo Rabain, Fairmont Hotel Manager Marie Chapoton; BHI’s Malika Cartwright; Minister of Social Development & Sports Michael Weeks, Minister of Economic Development & Tourism Jamahl Simmons along with some of the newly certified guest room attendants. Do they have a job now? It’s called being in touch with your PEOPLE! The oba/UBP needs some more brothers recruited to teach them how to do this and I’m not talking about the consultant you hired before the election. It would be great if your type of person REMAIN OUT OF Bermuda. Your type are useless to the betterment of the BORN BERMUDIAN! Your type wish US Bermudians the worst. No, it’s just that we don’t want to waste high salaries on 3 ministers doing something that, at most, one minster could have done. You’re too stupid to understand that. This is an outstanding accomplishment by the PLP! They were elected for the purpose of increasing the number of Bermudian maids and trash truck workers. Keep the foreign workers out. I LOVE what San Patrick has written. Honesty. We cannot go to the foreigners’ countries and demand ANYTHING!! Why do we need a formal qualification to be a room attendant? Isn’t this a bit much? I do believe that you will find the world over at major 4/5 star resorts that only certain room attendants can work in certain floors. It’s a way on ensuring that the rooms are kept to the standard required by those very rich special guests. So I would expect the same at both Princess hotels in Bermuda on their Gold floors. It looks like North Korean propaganda photos, with the ‘Elite leadership’ playing to working class. For an labor party, through policies they introduced, a basic entry level job such as cleaning a room, washing dishes or sweeping the streets (which was prior to them, only needed on the job training at most), now requires certifications. And it’s not even anything useful that can be recognized internationally or help the person get additional pay. Where are the five star hotels they refer to? Well done to all the participants who will now have a hospitality career ahead of them. Congratulations also to the PLP, BHI and Fairmont. This is exactly what’s needed in Bermuda – proper training for the entry level jobs in hospitality so Bermudians are part of, and invested in, their own community. Let’s see more of this and see it expanded to other areas. A big win. Bermudians can get those jobs now without this program…it’s just the pay, long hours, working holiday times, etc that turns guys off…jus saying! Its unbelievable how some people just find negativity in everything. Well done to all those involved in making it happen. Congratulations to the individuals who took the time to properly hone their hospitality and room attendant skills. Anyone who has ever traveled appreciates that a good room attendant is very important to the travel & tourism industry. We value you and your efforts. To the PLP thank you for making the effort to get these people marketable and transferable skills. Discipline, teamwork, and reliability will help in any job. We can no longer complain that Bermudians won’t do entry level jobs or that the government doesn’t care.